Some songs, some voices creep up on you incrementally winning your affection the more you hear them. Others like the song, ‘The Wind’ and the voice of Nolan Strong immediately, inescapably, haunt your imagination. In this case haunt may be too timid a term – it would be more accurate to say that, ‘The Wind’ in all its mysterious majesty took Possession of my imagination and held sway there for many months from the moment I was first exposed to its eerie brilliance. The only other song that’s had this effect on me was the late Nick Drake’s spectral, ‘Pink Moon’ which seemed a threnody from a drowned soul five fathoms down in an unforgiving sea. In a dream that the wind brings to me’. The Wind reminds me yet again that the musical instrument that has the greatest power to affect my emotions and my spirit is the human voice. A voice like Nolan Strong’s calls out to the soul in a way that admits no explanation that can be understood in technical analysis using terms like pitch, tone and decibels. Nolan Strong’s voice can only be appreciated in terms of stilled heartbeats, stilled breath, cradle memories ….. In the song Nolan’s universe unlocking high tenor lead is supported by his colleagues in The Diablos. They had formed In 1950 at Central High School in Detroit when Nolan met fellow singers Juan Guieterriez (Tenor), Willie Hunter (Baritone), Quentin Eubanks (Bass) and Bob Edwards a guitarist. They listened in particular to the wonderful and immensely influential recordings of Clyde McPhatter with The Dominoes. Nolan Strong like Elvis Presley and scores of other singers was deeply impressed by the glorious élan of Clyde’s vocals – a song sung by Clyde was given wings and soared thrillingly into stark distant spheres of the sky above us all. Practicing and practicing and practicing and performing anywhere they were allowed The Diablos honed their sound as 1950 became 1951 then 1952 then1953 and then 1954. Eventually they fetched up at an address that would be part of the legend of the Detroit music scene. Not 2648 West Grand Boulevard where the entrepreneurial genius Berry Gordy would establish the sound of, ‘Young America’ in 1959 but 11629 Linwood the home of Fortune records run by Jack and Devora Brown. Fortune was a, ‘Mom and Pop’ operation set up in the late 1940s hoping to make hits from Devora Brown’s songs and the talent pool latent in Detroit’s huge African-American population. The Browns were short on cash and the recording facilities at Fortune were primitive even by the standards of the time. Yet Fortune had imagination and in Devora a distinctive songwriter. The first Diablos recording was a Devora song, ‘Adios, My Desert Love’ which charmed Detroit with its Latin rhumba accents and the intricate interplay of the harmony vocals underpinned by castanet and piano accompaniment. Their next single was Fortune 511, ‘The Wind’ co-written by Devora and The Diablos. The recording features acoustic bass, vibes and electric guitar in addition to the delicate orchestral blend of vocals surrounding, cushioning, the astounding lead of Nolan Strong which both in its sung parts and the recitation prefigured the soundscapes conjured up later by Smokey Robinson and Michael Jackson. The first fifteen seconds of instrumental introduction establish an otherworldly atmosphere which is retained throughout the duration of the recording. The Diablos when they enter establish an anchor for our ears before Nolan enters taking us to uncharted realms with the heaven rending purity of his vocal. Nolan’s vocal contains both the comfort of the cool summer breeze and the chill of lost love’s memory. His vocal caresses us as once his lover caressed him. What could be more tender than Nolan’s vocal here? There are some days in our lives we can never forget. Days which become emotional touchstones which as the years go take on a hallucinatory power when recalled – sometimes voluntarily, sometimes emerging unheralded into our startled consciousness. I believe in the collective unconscious and it is clear to me that Nolan Strong and The Diablos dived deep into it when recording, ‘The Wind’. Listen to the last dying fall of the song and you will know that this is a dream that will always linger on. As long as we have hearts that beat and minds that dream it will linger on. Even until the heavens above can no longer shine. Even until then. Nolan strong died at 43 in 1977. His voice will always be with me and if you listen to any compilation of Nolan Strong and The Diablos I am sure it will stay with you as well. Songs to particularly look out for include, ‘Daddy Rockin Strong’, ‘The Way You Dog Me Around’ and, ‘Mind Over Matter’. I also recommend that you listen to Laura Nyro’s cover of The Wind from her essential album, ‘Gonna Take A Miracle’ which she recorded with the vocal group Labelle. Laura, whom I will write about often here, records the song as a tender homage to her days on New York street corners singing songs like The Wind which seemed to hang bright in the evening skies like the moon. Van Morrison – in The Days Before Rock ‘n’ Roll! Van Morrison is an only child. A child alone much of the time by inclination and perhaps vocation. A soul born to dream, to live in dreams and to birth those dreams in songs and singing – dreaming in God. As a boy growing up in East Belfast he was close to the sea and the countryside. From his house, beyond his bedroom, he could hear voices echoing over the Beechie River and imagine the mist swathed shipyard towers looming out of the night as the foghorns guided ships safely home. His head, heart and spirit opened up and welcomed dreams and intimations of an immortal world coexisting with the mortal world. Walking down Hyndford Street to leafy Cyprus Avenue he could be transported so that he was both thrillingly outside himself and strangely never so completely himself. Dreaming those young man’s dreams he found sustenance for his creative imagination in the sights and sounds of his home city, its hinterland, and in sounds closer to home emanating from the radio and the HMV record player. The radio and the record player would become almost sacred objects. The sounds they produced would enter deep into his consciousness, his soul; sounds he could never forget, sounds he would store as treasure and draw on for decades – fusing them through the mysterious alchemy of art into extraordinarily beautiful and affecting visions of his own. And these visions have their genesis in the days before Rock ‘n’ Roll. The days of post war austerity. Days which could seem monochrome, mundane and stultifyingly metronomic. Days when a dreaming boy hunched close to the radio and the record player in search of a rainbow for his soul. Together with fellow Irishman and fellow dreamer, poet Paul Durcan, he would dramatise those dreaming days in a song, ‘In The Days Before Rock ‘n’ Roll’ – a song which would catalogue some of the signposts of those dreams in a performance which has something of the hyper real, time slipping, giddy character of a waking dream. A performance which has me laughing out loud and punching the air with Joy as he hymns the stations and the musicians that called to him – that called his own unique voice into being. ‘In the Days’ is a dream that’s shot through with good humour, strangeness and charm. A dream that flows like a pure mountain stream strong enough to cut through stone yet gentle enough to dip your hand in. A stream you would surely want to let the goldfish go into! A dream brought to vivid life over four days in the studio by an intimate quartet – Paul Durcan as the inspired/crazed narrator, Dave Early on drums, Steve Pearce on bass with Van Morrison on animating spirit, piano and vocals. The sleeve notes tell me the song last 8 minutes and 13 seconds but that only records how long it lasts the first time you hear it – for once you’ve heard it it will be playing in your imagination and in your dreams for the rest of your life. Come aboard! 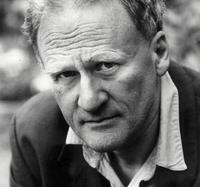 Paul Durcan is a maverick Irish poet who has been writing poems which fizz with emotional and literary energy for as long as Van has been writing songs which fizz with spiritual and musical energy. Durcan’s poetry speaks in an urgent conversational tone about almost every aspect of life not excluding the political, the sexual and the spiritual. Reading a Durcan collection is to be taken on a thrilling literary roller coaster ride which will have you laughing and gasping as well as exhilarated and emotionally pummelled. He is a performance poet on the page as well as the stage addressing his audience as friends and fellow campfire sitters as he examines the crazy world we live in. He seems to me to be wholly mad and wholly sane simultaneously – ideal territory for a poet to occupy. Who is Justin? Just a name plucked out of the air for its sound, its comparative rarity in a world awash with Jims and Georges and Pauls? Probably we will never know who this, ‘gentler than a man’ man was. Just a thought but it strikes me as not insignificant that an Irish poet from the latter half of the twentieth century would use a name which happens to be the little know second name of the greatest Irish poet of that era: Seamus Justin Heaney! Vintage radios such as those made by the Telefunken Company in Berlin were gorgeously tactile objects. Radios, humming with valve power and gleaming with polished wood, bakelite and glass, softly lit, took pride of place in our homes in the days before Televisions took up their imperial dominance in our living rooms. No point and shoot remotes then! Radios were switched on and off and tuned to stations using knobs that clunked satisfyingly into position and dials that you set spinning to call up and capture sounds from distant lands beamed in from the ionosphere. The very air crackled with possibility as you waited for the signal to settle as you settled down to laugh along your favourite comedians, sing along with your favourite singers, gasp at the heroics of your favourite detective or be amazed by a discovery as the spinning dial led you into imaginative territory you had never dreamed existed. Radios conjured up dreams, created communities of interest and painted pictures that seared into our memories. Radio, despite all the technological developments of the last few decades remains the dreamers ideal companion. Tune in! One of the great pleasures of vintage radio was discovering what programmes were made by exotically named radio stations broadcasting from places which often had to be looked up on an atlas to see where they were! Not knowing what you might find and be introduced to was exciting and expanded our cultural horizons. I’ll take spinning the dial over preset culture any day of the week: only listening to what you already know you like narrows your horizons and precludes the revolutionary discoveries that open up new worlds. As you scanned the stations on the radio dial even reciting their names became a form of litany – clearly recognised above by Paul Durcan who has a genius for incantatory recitation. Radio Luxembourg had a very powerful signal (on 208 metres Medium Wave) which washed tidally over the British Isles bringing many young people their first regular exposure to those new fangled musics their parents just knew were no good for them. Luxembourg, in contrast to the BBC, was a commercial station which meant it was happy to devote whole programmes to showcasing the new releases from record labels such as Capitol and Phillips. On Saturdays at 8pm in 1956 (when Van was aged 11) you could listen to, ‘Jamboree’ – described as two hours of non-stop, action packed radio featuring ‘Teenage Jury’ and American disc-jockey Alan Freed with an excerpt from his world changing show, ‘Rock ‘n’ Roll’. Athlone is a historic Irish town on the shores of the River Shannon. From the 1930s to the 1970s the principal transmitter for Irish radio was located in Athlone and the Irish national radio station came to be known on radio dials all over the world as Athlone. The fledgling Irish state was keen to promote native culture with Irish sports and traditional music being prominently featured. Athlone is also the birthplace of the great Irish tenor Count John McCormack whose golden voice resounded all over the globe in the first half of the twentieth century. Like Van he had a voice that was able to express the normally inexpressible – a voice that could send shivers through the soul. One of the spin-offs from the presence of GIs in Europe as a result of WW2 and the ensuing cold war was AFN whose broadcasts of American music could be listened to by Europeans hungry for the jazz and blues based music which was so hard to find anywhere else. Being near an American military base was a boon both for the likely strength of the signal and the possibility that personnel from the base might have records never seen in domestic stores. Lester Piggott (‘The long fellow’) was, as my Dad would have told you, the greatest horse racing jockey who ever lived. He won England’s premier race, The Epsom Derby, an almost unbelievable 9 times from 1954 as a teenager with, ‘Never Say Die’ through to 1983 when he won with, ‘Teenoso’. Lester Piggott became an almost mythical figure not just in the world of the turf but in the folklore of the nation. Children and grandmothers who never opened a racing page in their lives would go into a bookmakers on the day of a classic race and simply say, ‘I’ll have five shillings on whatever Lester is riding!’ And, very, very often that turned out to be a very smart bet for no one was a better judge of what horse to ride than Lester Piggott and no one more capable of riding a race with ice cool expertise to ensure victory. Lester was a close mouthed man with a very dry sense of humour – he had no time for the hoopla of celebrity. He he lived to win horse races and he spoke horse with a fluency that’s probably never been matched. Fats, Elvis, Sonny, Lightning, Muddy, John Lee!, Ray Charles:The High Priest! The Killer: Jerry Lee Lewis, Little Richard. Van Morrison was extraordinarily fortunate to be the son of a father who had lived in Detroit and who had a fabled collection of blues and Rhythm & Blues records young Van could immerse his thirsty soul in. As he says he heard Muddy Waters and Blind Lemon on the street where he was born. Leadbelly became his guiding spirit. A spirit he has remained true to over five decades and more of music making. The radio brought to him and millions of others the original Rock ‘n’ Roll creators – the revolutionaries whose legacy will live for ever. The greater the distance we are from those giants of the 1950s the greater their genius is clear. They were the guides and spirits who befriended us – who turned on the coloured lights for whole generations. Their genius is lovingly celebrated in the roll call here to form an honours board of immortality. There can be no doubt that Van Morrison has joined that company. ‘We certainly got a lot of beautiful things in there Van’. Thanks to Kerry Shale for suggesting the topic of this post. For those of you who may not be familiar with the name Kerry is a multi-talented actor, writer and voice over artist. He also, obviously, has great musical taste! ‘They were the shyest, sweetest group …. You rooted for them – wanting them to be successful … They exuded innocence, they listened, they performed … What you heard was who they were .. And they just sang from the heart. They deserve recognition and respect.’ (Ellie Greenwich on The Dixie Cups). By the middle of 1964 The Beatles had virtually annexed the Number One position in the US Hot 100 chart. ‘I Want To Hold Your Hand’, ‘She Loves You’ and ‘Can’t Buy Me Love’ rested atop the chart for fourteen straight weeks and surely, ‘Love Me Do’ which hit the summit at the end of May would extend their imperial sway even further. Who could stop them? Well, as no one but Nostradamus could have predicted The Beatles were turfed out of the top spot not by another British Beat group or one of the titans of American Pop but by three shy young girls from New Orleans, collectively known as The Dixie Cups. The members were sisters Barbara and Rosa Hawkins and their cousin Joan Johnson. Their debut single, the immortal, ‘Chapel of Love’ elbowed John, Paul, George and Ringo aside and selling over a million copies took up glorious residence at Number One for the first three weeks of June 1964. Unless you’ve wholly surrendered to soul deadening cynicism the sheer romantic charm of, ‘Chapel of Love’ is bound to win you over as it celebrates in a tone of sure hearted happiness the delights of marriage and the dizzy joy of a wedding day. Doesn’t everybody want, or remember with affection, the day when the sky was blue and the birds sang, as if they knew, that this precious day was the much longed for and now finally here, ‘I Do Day’? Doesn’t everybody want, once in their life, for the sun to shine brightly and believe, or at least hope, that, ‘I’ll be his and he’ll be mine until the end of time’? Doesn’t everybody want to believe, hoping against hope, that they will never be lonely any more? I do. I did on the day I got married all those years ago and I still do now. And listening to the lovely innocence of The Dixie Cups familial harmonies I believe once again in the power of simple words and simple melodies to illuminate and provide inspiration and comfort throughout the dramatic phases and stages of life in all its simplicity and infinite complexity. I love; the relaxed tempo of the song, the finger snaps cueing in the bass and drums, the angelic affirmation of the vibes, the haze of the horns seeming to wish the happy couple bon voyage as they set sail for the future and the way the vocals suggest joy being welcomed and embraced as a natural fact. Listening to the song it sometimes feels like I’m taking time out to swathe my spirit temporarily in a cocoon of bliss. Perhaps I’m also seeking reassurance and fortitude for the day ahead – whatever it may bring. All I really know is that, ‘Chapel of Love’ is a song I never tire of. Though this was a debut single for The Dixie Cups the team behind the record reveals a gallery of some of the most important figures in the popular music of the 1960s. The girls had been brought to New York by their musical mentor, Joe, ‘You Talk too Much’ Jones. He was involved in selecting songs for them and in producing, ‘Chapel Of Love’. The song was written by the (then!) husband and wife duo of Jeff Barry and Ellie Greenwich who rank with Lennon & McCartney and Holland, Dozier, Holland as authors of classic hits. Think of, ‘Da Doo Ron Ron’, ‘Then He Kissed Me’, ‘River Deep – Mountain High’, ‘Do – Wah – Diddy’, and, ‘Leader Of The Pack’ just for starters! The record was also a debut for Red Bird Records run by the legendary songwriting/production team, Leiber and Stoller, and a storied figure in the New York City music scene and the vocal group world, George Goldner, who between them had helmed dozens and dozens of hits. The truth of the above statement is surely proved by the (largely fruitless) attempts that have been made to explain what The Dixie Cups other great hit from March 1965, ‘Iko Iko’ is really all about. I could (as is my frequent wont) launch into a scholarly disquisition on the role of West African tonal languages and folkloric culture in Haiti, Cuba and New Orleans on the genesis of the song with footnoted excursions into Native American interaction with slave populations and the tangled web of copyright and intellectual property rights (summed up in the music business with the wise saw, ‘Where there’s a hit there’s a writ!). But, I think, on mature reflection you would rather just hear an unforgettable song which returns us all to the playground of our youth (which many of us think we should not wholly abandon) with memories of rhymes we never knew the meaning of but which just made us happy and strangely empowered when chanting them out in unison. The legend goes that The Dixie Cups were goofing off in the studio and launched, impromptu, into a song they had learned at their grandmothers’ knee. The percussion effects are supposedly provided by striking a chair and metal ashtrays! In the booth, the ever canny Leiber and Stoller realised that such magic must not be allowed to vanish into the ether. So, they kept the tape running and with minimal overdubbing – Voila! A never to be forgotten hit was produced. The Dixie Cups only had a short 18 month or so career as hit makers (though they still perform even now). Yet, there is no doubt in my mind that the gloriously open hearted records celebrated here will forever retain a place in the annals of pop music and more importantly in the lives of all who listen to them.